It took six years, but at the end of the day Gov. 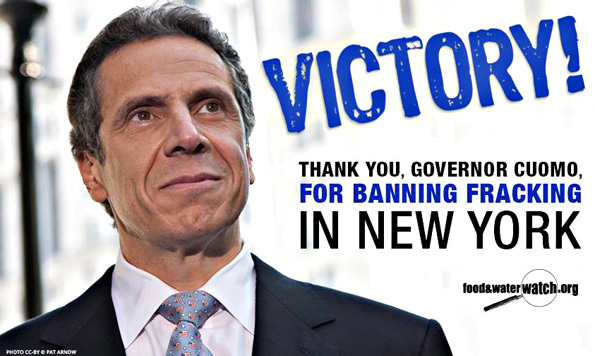 Andrew Cuomo has risked the wrath of the energy industry and made permanent the ban against hydraulic fracturing in New York. The experts in health and conservation under Cuomo were in agreement that there was an absence of reliable health studies or proof that drillers can protect the public as well diminishing economic prospects associated with fracking. Hydraulic fracturing is a well-stimulation technique in which rock is fractured by a hydraulically pressurized liquid to extract shale gas, tight gas, tight oil, and coal steam gas. While the energy industry supports fracturing for its economic benefits, opponents have raised concerns about the environmental impact of the process including contamination of ground water. According to poll figures, New Yorkers are about equally divided about fracking, but Cuomo has supported his health commissioner's view that he wouldn't want his family to live near it [fracturing] and suggested it could be like secondhand smoke, which studies have found to be harmful. "If the state health commissioner [Howard Zucker] doesn't want his kids living there, then I don't want my kids living there and I don't want any New Yorker's kids living there. I am not going to put health at risk for jobs. I'm not going to make that choice." While Cuomo has come under fire for his decision from business interests in the Southern Tier, some of whom may see his decision as one based in politics, he has won praise from environmentalists who say he made the right decision for the safety of New Yorkers. The decision by the governor certainly plays well among his liberal followers in New York and maybe beyond the state's borders as many believe he still harbors presidential ambitions down the road.